Round Rotherham Trail Race - with electronic punching. For those who missed it, the Round Rotherham is an ultra-distance cross country trail event following the approximate route of the ROTHERHAM boundary, for 50 miles / 80 km along footpaths, towpaths, tracks and roads, based on an idea from club secretary Ralph Rowbotham. There were 123 starters, walkers, slow and fast runners and an 8-stage relay with 15 teams. KERRY BOOTH produced a storming run to take this race by almost half an hour on his 12th attempt. The local veteran, who had previously been second, third and fourth, overcame quagmire underfoot and misty overhead conditions, breaking away just after halfway to land a popular win. "I was better prepared this time than I'd ever been," said the winner. Spare a thought, however, for top Zimbabwean international Blessing Kavai, who had travelled here for his first attempt at the event. His tactics were to latch on to one of the leaders who would hopefully keep him an the correct route: unfortunately he chose a runner who himself did not know the route and his challenge came to an end near Maltby, with 12 miles still remaining. KERRY Booth produced the run of his career when he achieved his ambition and won the Rowbotham's Round Rotherham 50 mile trail race on Saturday. Rotherham Harrier Booth (41) was competing in the annual ultra distance test for the 12th time and, despite the cold and foggy weather and muddy underfoot conditions, he covered the multi-terrain route, which started and finished at Brampton Leisure Centre, in his fastest ever time of 7 hours 8 minutes 37 seconds. After his well deserved triumph the man from Kiveton Park said: "I've competed in the event many - but I.never really thought that I would win it. "The muddy conditions made it hard going but that suited me. 'Things went my way right from the start with the race being run at my pace. I still felt comfortable at the 35 mile mark where I began to get away from the opposition. "I had to keep telling myself to run my own race and to keep a lid on it and not carried away. It was a fantastic feeling on the run in to the finish knowing that I was going to win, particularly as my son David ran with me over the last few hundred yards and my wife Alison, who has given me so much support, was waiting on the line," he added. Runner-up was Dark Peak Fell Runner Mike Robinson, who was making his debut in the event. Sheffield man Robinson (33) was timed at 7:35.03 ahead of 1999 winner Sholton Strider Andy Brookes (7:42.26), High Peak's Phil Gwilliam (7:42.26) with another Shelton Strider David Thomton (7:43.27) in fifth place. In sixth was Rotherham Hanier Mike Amistrong (8:18.41). Armstrong (39), from Swinton, was competing in the event for only the second tirne and bettered his last year's effort by 20 minutes. 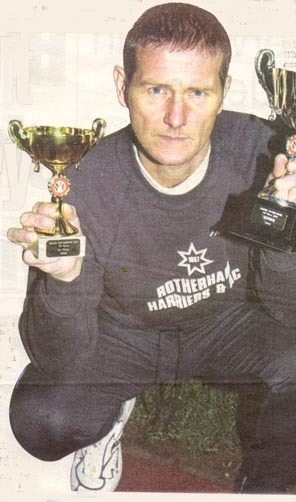 Making up the winning Harriers team in seventh spot was the club's ultra distance hero Brian Hamey (8:26.17). Following close behind were Harriers Mick Marsters (8:30.41), William E Watson (8:34.34) and Phil Haigh (8:36.04) and Striders Stuart Wright (8:36.0-4), Muneer Saif (9:13.47), Steve France (9:45.27) and Karl Smiles (9:48.35). Successfully defending her ladies title was Great Britain's number one and Europe's number five ranked female ultra distance runner Sharon Gayter (9:16.07). 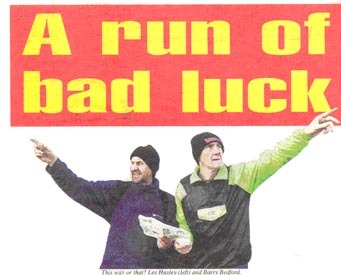 The 39-year-old New Marske Harrier was contesting the event for the sixth time and was using it as a training run for the Flora One Thousand Mile Challenge which starts in March and which finishes up with the competitors running the London Marathon. Winners for the first time of eight race was the Kimberworth Striders Yellow Perils squad of Martin Broadhead, John Tollerfield, Phil Roberts, Shaun Hogton, Peter Bunker, Dave Swann, Nick Lancaster and Steve Ross, with their time of 5.43.12. Striders also provided the team of Lee Crow, John MeDermott, Keith Ward, lan Brookes, Pairick Rooney, David Booth, John Lynch and Alvin Hickling which claimed runners-up spot on 6:24.11. In third at 6:57.56 was Maltby's RC's Squirrels Squad of Bob Houghton, Andy llompson, Don Buxton, Mick Barber, Brian Lowndes, Gary Durham, Steve Durdy and lim Rust. Mixed Team trophy winners was the Dark Peak Fell Running squad on 6:58.09. Rotherham Harriers once again won the women's team prize with their outfit of Paula Fisher, Gillian Bunker, Jenny Horan, Sharon Burton, Patricia Muller, Christine Mullarkey, Jacqueline Shannon and Adele Morris recording a time of 7:05.31. Overall sixth place on 7:06.46 went to Rother Valley Swallows Stuart Lake, Beverley Lake, Brian Devine, Karen Bentley, Sue Briggs, Martin Briggs and Richard Harris. 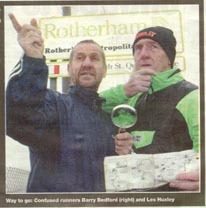 THE Round Rotherham Run. Sounds simple enough doesn't it? You run on a course around Rotherham-it takes around eight hours. 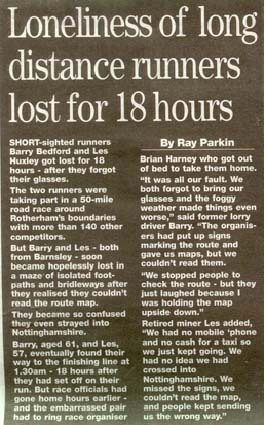 But a disorientated duo from Barnsley gave organisers the run around when they disappeared- returning more than 19 hours later. Red-faced Barry Bedford (61) and Les Huxley (57), of Bamsley Athletics Club, finallly realised they were lost when they found themselves entering Sherwood Forest! Mr Huxley said: "We were so much off course that we couldn't make much sense of the map that all the runners are issued with. We had a couple of pounds on us ,which we used to buy some chocolate to keep us going." His team-mate added: "It began to get dark and as both of our eyesights are not too good we had difficulty in reading the map. When we saw a sign saying Robin Hood Country we knew we were going in the wrong direction." Mr Bedford said he had entered the race six or seven times-getfing lost every time-but said that he had never failed to finish the race. The pair left Brampton Leisure Centre with the other runners at 7am and clocked in at the first checkpoint after eight miles-then disappeared. for a pint themselves by then. And just when they thought their bad day could not get worse they arrived back in Brainpton to find that their bikes had disappeared, presumed stolen. Thankfully former Rotherham Harriers chairman, Brian Harney, had taken them back to his house-and left instructions on the empty bike rack to contact him. Mr Harney finally got a call at 1.45 am and he took the pair, and their bikes, back to Bamsley- arriving around 3am. Race organisers were furious with the pair for not keeping in contact when they realised they were lost-but were relieved they turned up safe. The police had been called and cheeks made with local hospitals. Mr Harney said: "I was really annoyed-1 was fuming to be honest- but after 1 had shouted and bawled at them 1 just felt sorry for them." But he said they would be welcome to compete in next year's race and the intrepid duo say they are determined to give it another go! and you the participants for making the effort of putting on the event worthwhile.